Keeping chickens does make me appreciate any recipe that includes eggs, and the more the merrier. I especially collect recipes that will help me conquer the mountain of eggs that regularly accumulates in my house and as first impressions are so important, find myself going straight to the egg count when reading a new recipe. 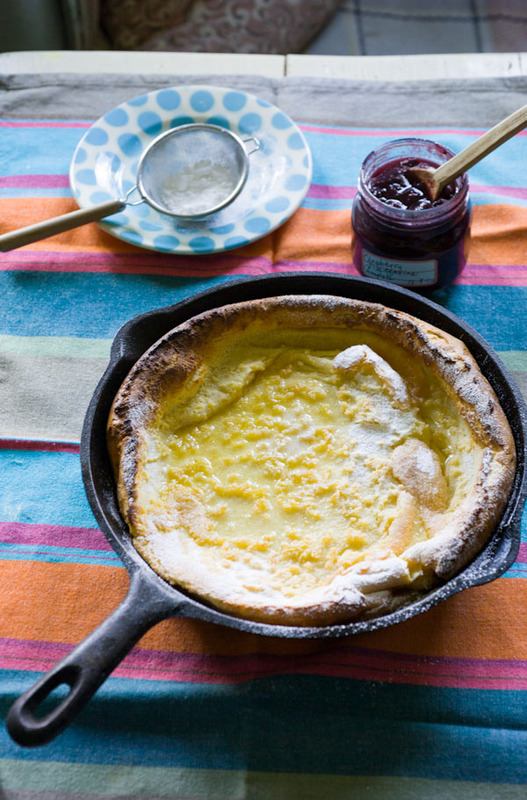 Too many eggs is always a good excuse to make a dutch baby pancake, not that excuses are needed. As well as an over-abundance of eggs, there might be no bread in the house for toast and there are always jars of preserves and compotes need emptying. A dutch baby is perfect for a late breakfast / brunch type of thing at the weekend or great at any time when a pudding is called for. 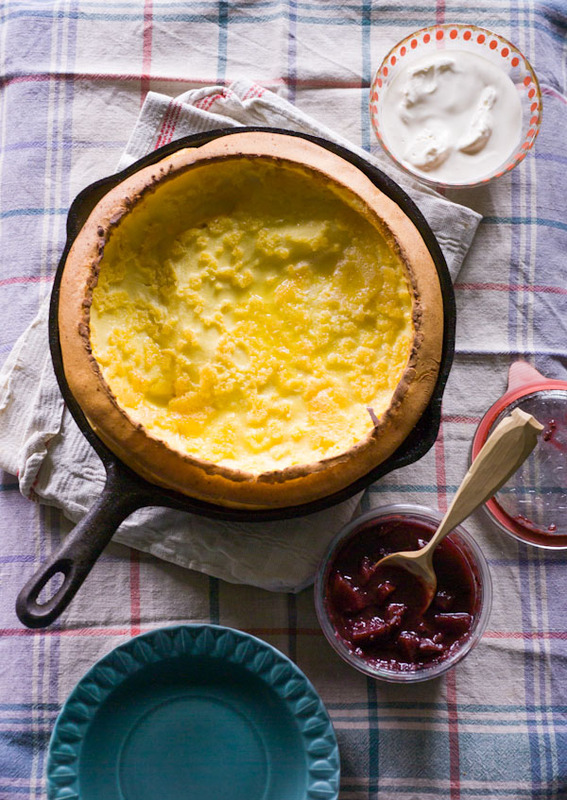 If you have never experienced a dutch baby, it is basically somewhere between a big fluffed up Yorkshire pudding and a gooey egg custard, crisp along the edges but soft and luscious in the centre. I like to make mine in a cast iron skillet that goes straight from oven to table, but you can make individual ones in a Yorkshire pudding tin if you like, just adjust the cooking time and keep an eye on them. The pancake puffs up and every time you make one you get a slightly different wild and wonderful result The down side is it will then quickly deflate, still looking pretty good but not such a show stopper. This provides an ‘ooooo’ factor to the proceedings and does require everyone to be ready at the table, to really appreciate the full experience. I most often add my homemade vanilla essence and pop open a jar of compote to go with; nectarine and blueberry compote being my absolute favourite, then really push the boat out by serving with cream, the thicker the better! Alternatively you could add some lemon juice and zest to the batter. Maple syrup, caramelised apples …. well I wont go on, but you can serve the pancake with all manner of accompaniments, all equally delicious. Preheat oven to 230C 450F Mk8 and place a 30cm (12in) skillet on a central shelf with plenty of room above for the pancake to puff up. Place all of the ingredients except the butter in a blender and blend until everything is combined to make a batter. You can prepare the batter in advance if you want and keep overnight in the fridge. Remove the skillet from the oven and quickly add the butter, which will melt and bubble immediately. To keep it good and hot, I usually place the skillet on a hot hob whilst doing this. Pour in the batter and immediately place back in the oven. Bake for 20 minutes, until the pancake has puffed up nicely and the edges are looking golden brown. Serve immediately.